Water Direct has announced that Hafren Dyfrdwy has become the latest water company to invest in its Nationwide Bottled Water Bank. The move secures emergency bottled water supplies to satisfy Hafren Dyfrdwy’s SEMD requirement in Powys and in the area around Wrexham, in the event of loss of water supply. Hafren Dyfrdwy, which means Severn Dee, the two rivers running through Wales, became the new water company for all former Severn Trent and Dee Valley Water customers in Wales in July 2018. Its dedication to customer excellence includes 24/7 customer service and a dedicated business support team. Additionally, Hafren Dyfrdwy has created a dedicated Care and Assistance team to safeguard its most vulnerable customers. By joining Water Direct’s Nationwide Bottled Water Bank, Hafren Dyfrdwy has assured the shortest available response time for its customers in the event of a water supply interruption. 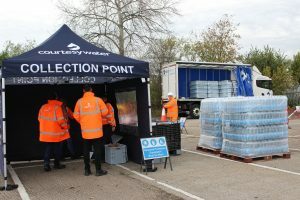 The service provides a large nationwide supply of emergency bottled water, stored at strategic locations across the UK for fast response deployment via its dedicated fleet. The scheme allocates pre-agreed stocks of two litre bottles that can be delivered to pre-arranged sites, or direct to doorstep for vulnerable customers. Rob Allan, Senior Wholesale Relationship Manager at Water Direct commented, “Hafren Dyfrdwy has a clear investment in the welfare of its customers in creating and delivering support and communications. Partnering with Water Direct to ensure a fast response and access to alternative water supply during an incident enhances Hafren Dyfrdwy’s commitment to delivering excellence and exceeding customer service requirements”.